The short answer is possibly, and no. The reason I am putting a possible to the answer is because it all depends on who does your eyelashes. The application of eyelash extensions is a very detailed process, and should certainly only be done by a trained lash stylist. But training is not enough. Patience, attention to detail, and strong work ethics are also required. 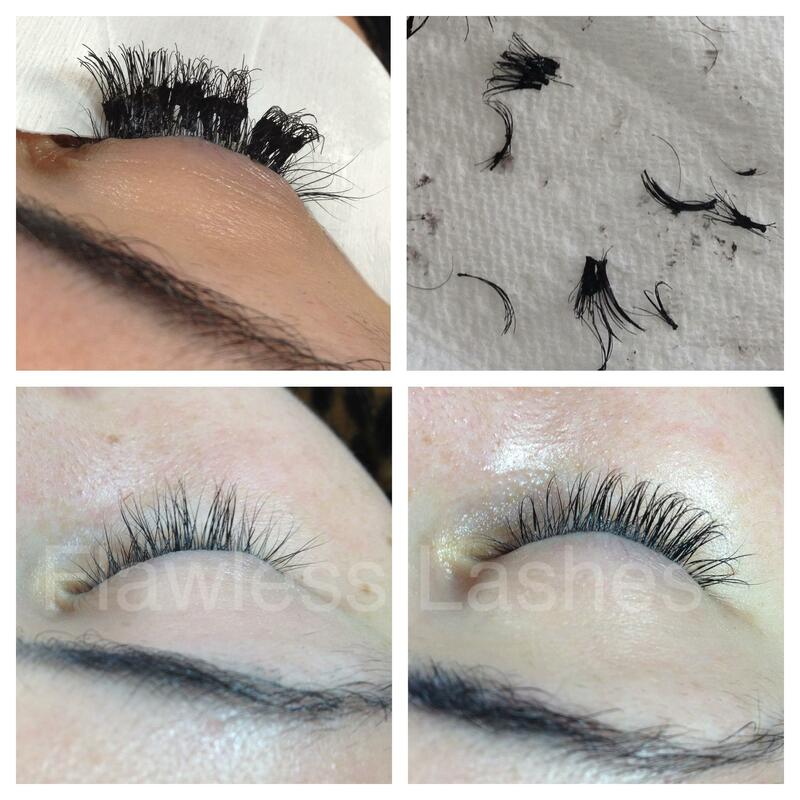 Nearly all “lash disasters” we have repaired come from trained, even certified, lash stylists. Just because someone has learned to do this skill, does not mean they have the qualities it takes to do it right. In addition to the right stylist, let’s back up for a moment and make sure we are clear on what eyelash extensions are. You may see signs for eyelashes for $40, or groupons for eyelash extensions for $60. Often they call these eyelash extensions, when in reality they are “cluster” lashes, or even more confusing- lashes called “Individuals”. These are NOT eyelash extensions. What we do are actually 1 hair on 1 eyelash. This is key: one natural eyelash. The reason being is your eyelashes grow all at different rates. You don’t start the month with all baby lashes, then they grow long all together, then all fall out together. You have a mixture of baby lashes, middle age lashes, and mature lashes- that are on the verge of falling out to make room for a new baby lash. When you have multiple natural eyelashes glued together when that mature lash sheds out- it tugs and pulls on all it’s neighbors that it is glued to- which can include baby and middle age lashes that are not ready to shed. When this happens it can feel itchy and sore on your lash line, and beyond that what is happening is damage. These are what you see advertised at nail salons and groupons. Bottom right photo is our repair. In addition to the pain staking process of making sure to isolate 1 single natural eyelash to extend, there is even more to getting eyelash extensions that don’t damage your natural lashes. There is a ratio of diameter and length of eyelash extension to natural eyelash that must be respected. Just because a client wants dramatic Kim Kardashian lashes, does not mean we can give her those lashes. It is 100% based on the condition, length, and thickness of the natural eyelash. A good ratio is about 30% length. We do not put extensions on that are a super thick diameter either. Do they give a dramatic look? Yes. Can they damage your eyelashes? Yes. If extensions are too long and too heavy for the natural eyelash to support it can put undue stress on the natural eyelash causing damage and premature shedding. Here you can see tiny baby eyelashes that have much, much larger and longer extensions put on. This can really stress the lashes and cause damage. We do not do this at Flawless Lashes. At Flawless Lashes we take the health of the natural eyelash very seriously. Since we can only glue an extension on a healthy natural eyelash, we have a vested interest in keeping your lashes at optimum health. We will apply a mix of eyelash extension lengths and diameters that your natural lashes can easily sustain long term. We apply these extensions to one single eyelash at a time, so your natural lashes can move, grow, and shed just as they normally do, without pulling and damaging. If you would like to see a short video of our application process, take a look at our video below to see the quality and detail of Flawless Lashes. Yes it can damage. Exposure to the glue to put an eyelash extension it can bad for your real lashes. Will professional removal damage your lashes? Hi Fiona, I am so sorry to hear about the state of your eyelashes. Properly applied extensions should NOT damage your eyelashes. But it take very meticulous application standards to achieve safe, non damaging eyelash extensions. Unfortunately not too many places that offer lash extensions have those standards. What I would recommend is removing your current extensions and using a growth type of product for your lashes. We love, and carry the Revitalash product. Revitalash has done wonders for our clients natural lashes to help them grow in long and full. Also you can take 10,000 mcg of Biotin to help speed up hair growth in general. If you want to wear cluster lashes, it is important that you gently remove them each night, but truly it may be best to just fill in your lashline as much as you can with dark eyeliner and let your lashes grow in naturally without any sort of enhancement. We wish you the very best, and please email us if you have any further questions.